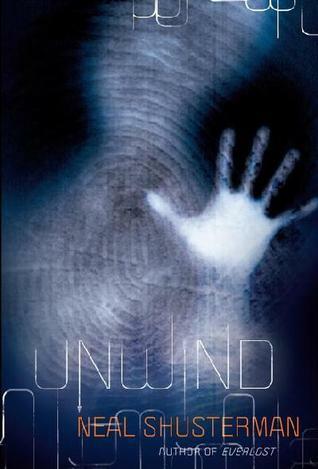 Unwind by Neal Shusterman has been on my reading list since… since the beginning of time? Well maybe not that long. But Unwind is probably one of the original books on my reading list. Of course, that list shifts and grows and changes and stuff and junk. So, when I saw the audio book for Unwind super cheap, I figured it was a sign that it was time to ‘read’ this. The Second Civil War was fought over reproductive rights. The chilling resolution: “a pregnancy could be terminated retroactively once a child reaches the age of reason”. Between the ages of thirteen and eighteen, parents can have their child “unwound,” whereby the child comes to live in a ‘divided state’. By law, they have to use every single part, so in theory no one dies via this retroactive termination of pregnancy. Holy frak!!! This is awesome. I am surprised that I did not lose a tooth or two from all the times my jaw dropped. I never knew where Shusterman was going with all of this. Every so often I would get ‘comfortable’ and BAM Shusterman drops a bomb or changes the game altogether. I love this book because it is compelling. I love this book because it asks you to think. I love this book because it is well-written with absorbing characters and a great plot. Mostly, I love this book because it is the first book of 2015 that made me buy book two right away. This entry was posted in Post Apocalyptic, Young Adult and tagged dystopian fantasy, Neal Shusterman, Second Civil War, Unwind, Unwind Dystology #1. Bookmark the permalink.